Seaton Bay is part of Devon’s Jurassic Coast line. Seaton is a small Devon sea side town on the south West coast of England. This stretch of the Dorset and East Devon coastline became a UNESCO World Heritage Site site in 2001. The landscape of East Devon and West Dorset includes Areas of Outstanding Natural Beauty. Seaton, lies in one of these areas where the Axe valley meets the sea. 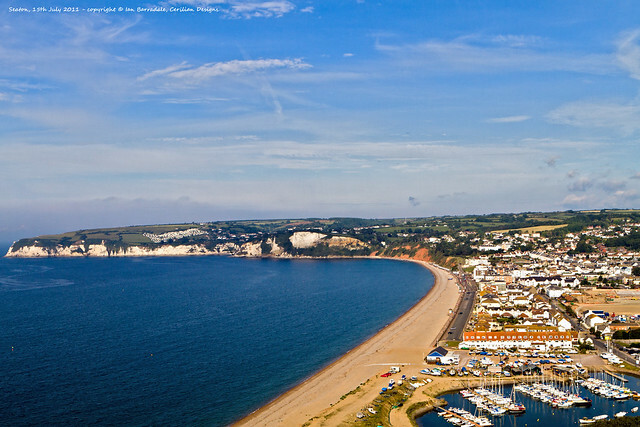 Seaton Bay on Devon’s Jurassic Coast is set in a landscape of outstanding natural beauty. The village of Beer with its own small bay enclosed by chalk cliffs, nestles in a valley. With picturesque stone houses and cottages built on the slopes of the surrounding hills. Working off the beach are fisherman whose families have fished here for generations. Their fishing boats are still launched from the beach to put out to sea and winched back on to the shore on their return. The 95 mile long Jurassic Coast World Heritage Site line is on the south coast of England in East Devon and Dorset. It displays a near continuous sequence of Triassic, Jurassic and Cretaceous rock features. Geographical features such as landslides, a barrier beach, lagoon, cliffs and raised fossil beaches. From Seaton, it is possible to see, walk to, or visit all three eras in this 185 million-year ‘geological walk through time’. more on the Jurassic Coast. Seaton Wetlands Nature Reserve stretches from the estuary at Axmouth to the village of Colyford. Mud flats, scrapes, grazing marsh, ditches and ponds attract birdlife throughout the year. Especially in the winter months. There are three Local Nature Reserves, Seaton Wetlands, Colyford Common and Black Hole Marsh. All owned and managed by East Devon District Council. Axmouth harbour is a small harbour which dries up on low tide and fills up as the tide comes in. It’s used for recreation and by local fishing boats. From the Iron Age to the Middle Ages, Axmouth Harbour was the most important harbour in the West of England. The natural harbour of the River Axe estuary was at that time a much wider and deeper inlet. The mouth of the Axe being almost half a mile wide. The South West Coastal path runs through the Axmouth Undercliffs NNR. From Axmouth Harbour to the Cobb Harbour at Lyme Regis. This section of the East Devon and Dorset coast line has been prone to land slips for thousands of years. land slips still occur due to the instability of the ground and cliffs. Walking the South West Coastal Path. The South West Coastal path passes through Seaton Bay Devon’s Jurassic Coast and the East Devon Area of Outstanding Natural Beauty. From Seaton walkers can go west towards the red Triassic cliffs of the coastline between Sidmouth and Exmouth. To the east into the dense woodland of the Undercliff National Nature Reserve. And onto the fossil bearing cliffs of Lyme Regis and Charmouth. The Axe Valley and East Devon. The East Devon landscape is an unspoilt treat. The South West Coastal path from Exmouth to Lyme Regis gives walkers on clear bright days some of the most stunning views in England. Inland there are intimate wooded combes. Vast areas of heathland, fertile river valleys and high hilltops with more outstanding views. The Axe Valley with its picturesque scenery. On the border of Devon and Dorset holds charming Devon villages and towns which are just a few miles from the coast. Seaton Town Centre is just off the sea front. The pedestrianized main shopping area is within walking distance. View Seaton Town Centre shops in a larger map.